Hello, all! 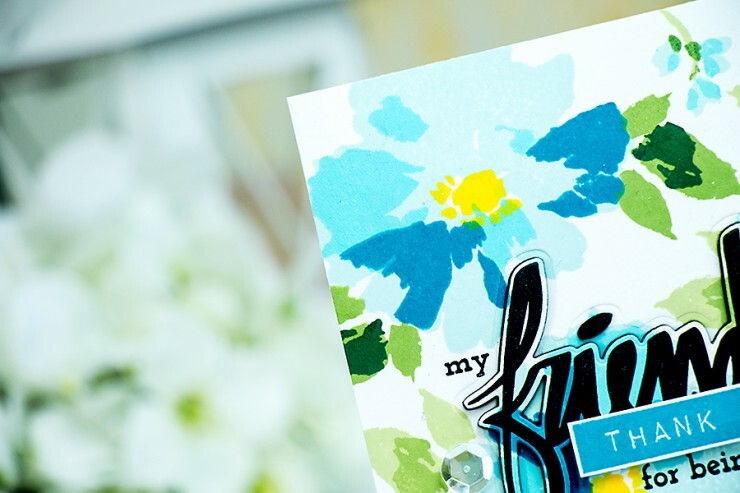 I’m up on Altenew blog today sharing a card with a beautiful stamped background. I wanted to do a video for this project, but the time just seems to slip away from me these days, so I’ll do my best to explain how I made it. I used stunning Watercolor Wonders stamp set to create the background for this project. I started with the largest flower and stamped it in top left corner of my Neenah Solar White panel using Sea Glass, the lightest Blue ink from Altenew; added a next layer of petals using Ocean Waves and finally the third layer using Dusk. The flower center was stamped using Warm Sunshine ink. I also added a few leaf clusters using greens and stamped additional flowers in the same manner. After my background stamping was done I stamped a large bold Friend in black in the center and used a matching die to cut it out. I also cut out an identical element out of black fun foam and adhered the two pieces together to create dimension and adhered the die cut onto its corresponding negative space. 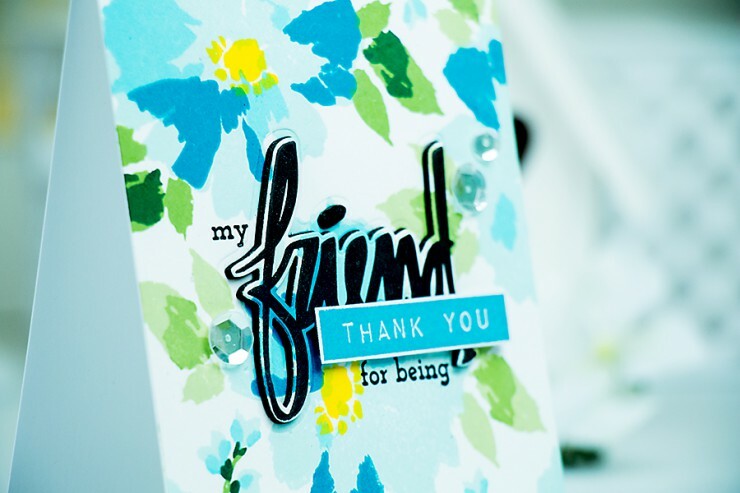 I stamped several additional words to create a simple Thank You For Being My Friend sentiment. Finally I added a few clear sequins from Pretty Pink Posh and that finished my card. Beautiful card Yana. Thank you. Gorgeous!!! Live these yummy colors!